The availability of complete genome sequences of versatile Pseudomonas occupying remarkably diverse ecological niches enabled to gain insights into their adaptative assets. The objective of this study was to analyze the complete genetic repertoires of metal transporters (metal transportomes) from four representative Pseudomonas species and to identify metal transporters with "Genomic Island" associated features. A comparative metal transporter inventory was built for the following four Pseudomonas species: P.putida (Ppu) KT2440, P.aeruginosa (Pae) PA01, P.fluorescens (Pfl) Pf-5 and P.syringae (Psy)pv.tomato DC3000 using TIGR-CMR and Transport DB. Genomic analysis of essential and toxic metal ion transporters was accomplished from the above inventory. Metal transporters with "Genomic Island" associated features were identified using Islandpath analysis. Dataset cataloguing has been executed for 262 metal transporters from the four spp. Additional metal ion transporters belonging to NiCoT, Ca P-type ATPase, Cu P-type ATPases, ZIP and MgtC families were identified. In Psy DC3000, 48% of metal transporters showed strong GI features while it was 45% in Ppu KT2440. In Pfl Pf-5 and Pae PA01 only 26% of their metal transporters exhibited GI features. Our comparative inventory of 262 metal transporters from four versatile Pseudomonas spp is the complete suite of metal transportomes analysed till date in a prokaryotic genus. This study identified differences in the basic composition of metal transportomes from Pseudomonas occupying diverse ecological niches and also elucidated their novel features. Based on this inventory we analysed the role of horizontal gene transfer in expansion and variability of metal transporter families. Metal ions play a variety of critical roles in the prokaryotic metabolism. Biological management of metal ions is accomplished by a complex interplay between metal ion transporters (transmembrane importers, transmembrane exporters) and their regulatory components . In the post-genomic era, genetic landscapes of the organisms have unveiled the hidden facets of metal ion transporters and associated regulatory cascade thereby paving way for study of their metal transportomes. The genus Pseudomonas is one of the most versatile and ecologically significant groups of bacteria on the planet that thrives well in metal rich biotopes. In recent studies, the unexpected capacity of Ppu KT2440 and Ppu CD2 genomes to endure exposure to heavy metals has been unraveled [2, 3]. In Ppu KT2440 metal transporters acquired through HGT were also reported . However, a systematic study of complete metal transportomes is unavailable for any of these Pseudomonas species. The availability of complete genome sequences for saprophytic P.putida (Ppu) KT2440, commensalistic P.fluorescens (Pfl) Pf-5, pathogenic P.aeruginosa (Pae) PA01 and P.syringae pv. tomato (Psy) DC 3000 [5–8] provided an opportunity for analyzing their complete repertoire of metal transporters along with the role of HGT in their acquisition. The genome sequence information of the four sequenced Pseudomonas spp Ppu KT2440, Pae PA01, Pfl Pf-5 and Psy DC3000 employed in this study were selected from TIGR-CMR database . TransportDB, a relational database describing the predicted cytoplasmic membrane transport protein complement for organisms was used as a substrate for building the metal transportomes . In order to search for homologs of a transporter family the best-annotated hit was used in a subsequent BLASTP search against the four genomes and retrieved the members. PFAM domain search was also carried out with the retrieved homologs, using CLC HMM algorithm  and PFAM database . Transmembrane helix prediction for the membrane transporters was performed using TMHMM version 2.0 . Genomic location and gene organization of transporters were identified from TIGR-CMR database. CLC protein workbench has been employed to analyse the metal transporter proteins . 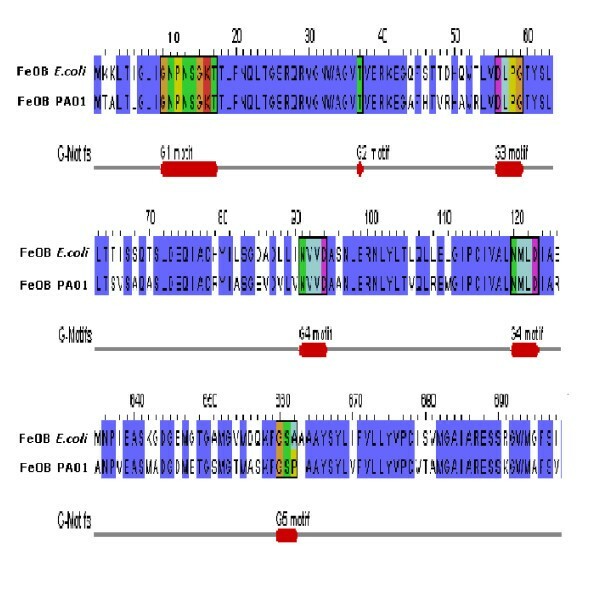 Genchek™ Graphical Viewer was used to represent GTPase signature motifs G1-G5 in the alignment generated for FeoB Eco and FeoB Pae . Phylogenetic analysis was performed with the characterised prototypes using CLC protein workbench . For this analysis, multiple sequence alignments (MSA) were produced using progressive alignment algorithm. The generated pair wise alignments were used for finding the evolutionary distance between the pairs. Pair wise distances thus calculated was used to create a phylogenetic tree-employing neighbour joining (NJ) algorithm with 1000 bootstrap replicates. Metal transporters located in sequence clusters, were identified by cluster viewer from PEDANT database . Cluster viewer aided us in identifying clusters of genes in the same organism that are paralogs. Sequence clusters thus obtained provided us with data regarding the metal transporters that have a BLAST similarity score greater than 45 bits in PSI-BLAST and also possess a similar Pfam domain with a significant E-value (typically 0.001). This tool helped us in determining paralogous genes of a family and aided in phylogenetic analyses. Island Path Analysis was used for the detection of metal transporters acquired through HGT . After generating the complete inventory of metal transporters, we inspected the genomes of four Pseudomonas species with island path software (IPA version 1.0 tool) for the identification of those transporters located in GI's or exhibiting GI associated features like anomalous %G+C, dinucleotide bias above 1 STD DEV, presence of RNA genes (tRNA, rRNA genes) and mobility genes (transposons, insertion sequences). A putative GI can be identified with certainty by the presence of eight or more consecutive ORF's with dinucleotide bias alone or dinucleotide bias plus a mobility gene in proximity. Based on the global features of the four Pseudomonas genomes we could draw a comparison among the genome size, number of genes, transporter proteins and total number of metal transporters (Table 1). Among the four spp, Pfl has the largest metal transporter inventory (75 metal ion transporters) while Psy has the smallest (54 metal ion transporters). Other pathogenic species, Pae has more number of genes and transporter proteins but relatively less metal transporters (63 metal ion transporters) than Ppu (70 metal ion transporters). Based on the TransportDB  we compiled the metal transportomes for the entire complement of alkali/alkaline earth metals (Na+, K+, Ca2+, Mg2+), transition metals (Zn2+, Mn2+ Cu+, Ag+, Mo2+, Fe2+, Fe3+, Ni2+, Co2+) and heavy metals (Cr3+, As3+, Pb2+, Cd2+) in Pseudomonas (Additional files 1, 2, 3, 4). These transportomes furnish information for class/family/subfamily, transporter classification number (T.C.No), TIGR locus, protein name, genomic location, orientation, length of the protein, TMD's, substrate and the predicted role of the above metal transporters. Sequence cluster analysis helped in identifying paralogs for the transporter families (see Additional file 5). In this study we employed the Transporter Classification system-TC system for systematic classification of Pseudomonas metal transporters into the following four groups: ATP-dependent (ABC superfamily, P-type ATPase super family) Ion-channels, Secondary transporters and Unclassified. A comparative analysis depicting the basic differences in the composition of transporter classes and metal transporter families from the four Pseudomonas species is represented in Table 2 (This table also provides expanded names of the transporter families). Apart from executing the dataset cataloguing, our analysis of Pseudomonas databases identified additional metal transporters belonging to Ca, ZIP, NiCoT, MgtC, ABC (copper), P-type ATPase (copper) families. Distinct features of transporters belonging to CPA3, CaCA, ZnuABC, MntABC, ZntA, Nramp, FeOB, OFeT, NikABC, Chr, PbrT, RND, CDF families and ABC super family were also reported. Search for primary ATP-dependent calcium pumps in Pseudomonas using two characterized members (SP1551 and SP1623) of S.pneumoniae  identified a Ca P-type ATPase (PA1429) in Pae alone with no reciprocal BLAST hits from other three species. ZIP family of transporters in Pseudomonas were retrieved using the experimentally characterized transporter ZupT Eco . Psy and Pae have single entities PA4467 and PSPTO_2053 while paralog expansion is seen for Ppu (PP_1836, PP_0947) and Pfl (PFL_4718, PFL_0910). Using the experimentally characterized efflux member RcnA Eco of NiCoT subfamily 2  as a BLAST query against Pseudomonas databases, we identified two new efflux members PP_2968 (RcnA Ppu ) and PSPTO_4280 (RcnA Psy ). The experimentally characterized MgtC family transporter Pae (PA4635)  was used in the BLAST P analysis to identify the following MgtC homologs: PP_3244, PP_3541 (Ppu), PFL_4077, PFL_2871 (Pfl), PA4635 (Pae). No hits were identified for this family in Psy. Pae uniquely harbours an ABC copper transporter PA3393 that is related to periplasmic copper binding protein NosD in Rhizobium meliloti whose function was presumed to insert copper into the exported reductase apoenzyme (NosZ) . All the CuPATP1 transporters of Pseudomonas (PFL_0710, PP_0586, PA3920, PSPTO_0750) were found to be the best BLAST hits for experimentally characterized CopA Ehi , while the other group of CuPATP2 transporters (PP_4261, PA1549, PFL_1915, PSPTO_1996) did not show significant BLAST identities with the characterized proteins of CopA, CopB. CPA3 family members constituting multicomponent K+ efflux system are present in all the three species except in Pae where this component is involved in sodium ion homeostasis. Ppu (PP_2225 to PP_2230) and Pfl Pf-5 (PFL_2606 to PFL_2611) have six component K+ efflux systems while it is a five-component system in Psy. CaCA transporters i.e. secondary calcium transporters in Pfl and Psy (PFL_0722 and PSPTO_0764) are annotated as Ca2+/H+ (ChaA) antiporters that exhibit significant homology to ChaA of E.coli . Proteins resembling mammalian Na2+/Ca2+exchangers (YrbG)  are present in Ppu (PP_0928), Pfl Pf-5 (PFL_0891) and Psy (PSPTO_4477). Pae PA01 lacks a distinct homologue for CaCA transporter. Representative Zinc transporters of Pseudomonas species are presented in table 3. ABC zinc transporters (ZnuABC) that recognize Zn2+ as their substrate and ABC manganese transporters (MntABC) that recognize Mn2+/Zn2+, were included in the phylogenetic profiling to study their overlapping specificities (Figure 1). Search for ZntA homologs in the Pseudomonas genomes using experimentally characterized ZntA Eco  resulted in identification of CadA as the closest homologue with 37% identity from all the four species. 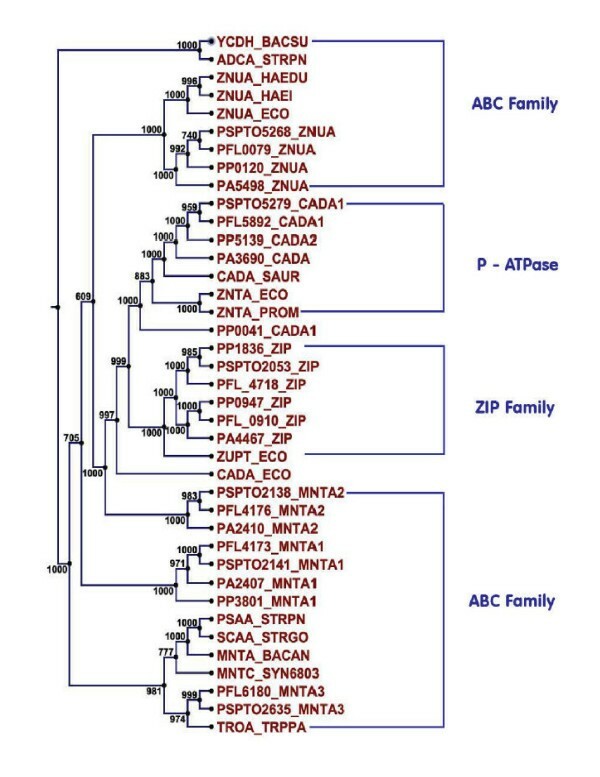 However in Pseudomonas, only CadA proteins with five (PFL_5892, PSPTO_5279, PA3690) or six TMD's (PP_0041, PP_5139, PA2435) were identical to ZntA. The other CadA proteins with seven TMD's (PFL_6191, PSPTO_5532) did not show any significant identity in BLAST analysis (less than 24% identity) and appear to be unrelated to ZntA. Phylogenetic tree for Zinc/Manganese transporters using neighbour joining method with 1000 bootstrap replicates. It depicts the grouping of various orthologs of Pseudomonas species from three families (ABC, P-type ATPase and ZIP families). BACSU, Bacillus subtilis; STRPN, Streptococcus pneumoniae; HAEDU, Haemophilus ducreyi; HAEIN, Haemophilus influenzae; ECO, Escherichia coli; PROM, Proteus mirabilis; STRPN, Streptococcus pneumoniae; STRGO, Streptococcus gordonii; BACAN, Bacillus anthracis; SYN6803, Synechococystis sp strain PCC6803; TRPPA, Treponema pallidum. 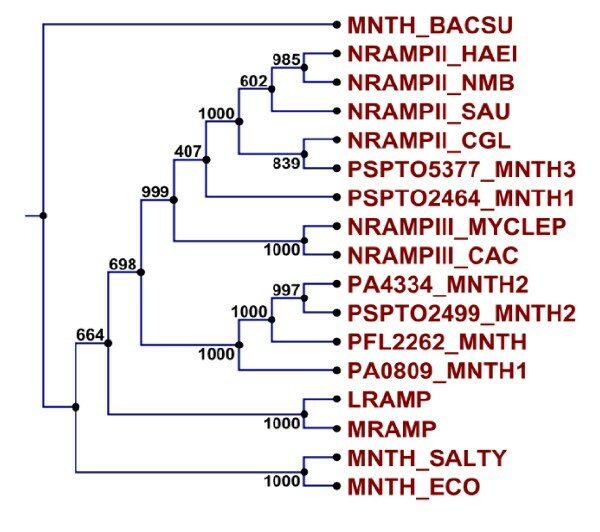 Only one Nramp member, MntH (PFL_2262) was observed for Pfl while Pae has two members MntH1 (PA0809), MntH2 (PA4334). Psy was found to possess three distinct members MntH1 (PSPTO_2464), MntH2 (PSPTO_2499) and MntH3 (PSPTO_5377) in this family. No conserved motifs characteristic for Nramp super family were observed for PSPTO_5377. However, phylogenetic analysis with Nramp family members confirmed its position in this family (Figure 2). Analysis of Lineage Specific Regions (greater than 2 Kb, enriched in mobile genetic elements and has genes specific to Psy DC3000) of Psy showed that PSPTO_5377 is the only metal transporter located in its LSR's (LSR no: 42). Phylogenetic tree for Nramp family of manganese transporters using neighbour joining method with 1000 bootstrap replicates. It depicts the grouping of various orthologs of Pseudomonas species within this family. BACSU, Bacillus subtilis; HAEI, Haemophilus influenzae; SAU, Staphylococcus aureus; CGL, Corynebacterium glutamicum; MYCLEP, Mycobacterium leprae; CAC, Corynebacterium acetylicum; SALTY, Salmonella typhimurium; ECO, Escherichia coli. Three types of iron transporters (ABC, FeOB and OFeT) were found in the Pseudomonas species with the restriction of FeOB transporter (PA4358) to Pae and OFeT transporter (PFL_3255) to Pfl (Figure 3). Based on the previous reports of GTPase motifs in FeoB Eco  highly conserved G1-G5 GTPase motifs were present in FeoB Pae (Figure 3). In OFeT Pfl two REXXE motifs (10REGIE14, 129REGLE133) were identified basing on the characterised prototype YcdN Eco . No iron transporters were reported for pathogenic Borrelia burgdorferi and Treponema pallidum while we reported substantial number of iron transporters for the pathogenic Pae and Psy (six and four respectively). Multiple sequence alignment of FeoB transporters from Escherichia coli and Pseudomonas aeruginosa PA01 depicting conserved GTPase signature motifs (G1–G5). In Ppu and Psy there are high affinity nickel uptake systems (Nik) of ABC family whose PBP's (PP_3342 and PSPTO_3088) belong to nickel/peptide/opine ABC transporter family. Two IMP's were identified for each of the two Nik systems, in Nik Ppu (PP_3343, PP_3344) and Nik Psy (PSPTO_3089, PSPTO_3090). They displayed a characteristic transmembrane topology of five (PSPTO_3089, PP_3344) and six TMD's (PSPTO_3090, PP_3343). Chromate transporters of Chr family mediating chromate resistance are present in all the three Pseudomonas species (PP_2556, PA4289, PFL_3149) except Psy. PbrT members conferring lead resistance are also present in all the four Pseudomonas species (PA5248, PFL_5990, PP_0180). As an exception Psy possess two PbrT systems, PbrT1 and PbrT2 (PSPTO_0141, PSPTO_3596). PbrT2 Psy did not show the conserved motifs found in other lead transporters of this group. Uniquely there is one ABC family member for Pb in Ppu (PP_5165) with no existing sequence homology to PbrT Ppu . The best-characterized heavy metal resistant strains R.metallidurans have eight HME-RND proteins on chromosome. In comparison, Ppu has six RND chromosomal determinants (PP_0043, PP_2410, PP_3302, PP_5173, PP_1517, PP_5387), Pfl and Pae have two determinants each (PFL_2558, PFL_5218 PA0158, PA2520) while no RND determinant was identified in Psy. Pfl Pf-5 has a maximum of four CDF transporters (PFL_2508, PFL_5419, PFL_0604, PFL_5222) while they are three in Pae PA01 (PA0397, PA1297, PA3963) and two in Ppu KT2440 (PP_0026, PP_4774). However Psy DC3000 has only one distinct ortholog (PSPTO_4790) in this family. Pseudomonas species has multiple paralogs for most of the metal ion transporters that are briefed out in Additional table 5. Some of the significant features of paralog distribution are highlighted in this section. Sodium ion transporters constitute the bulk of secondary transporters and has maximum number of paralogs distributed in different families (Table 4). Distribution of Sodium transporters in P.putida KT2440, P.aeruginosa PA01, P.fluorescens Pf-5 and P.syringae DC3000. A multitude of K+ transporters are present in Pseudomonas species among which Kdp system (in Pfl), VIC super family (in Pae and Psy), CPA2 family (in Ppu, Pae, Pfl, Psy) and Trk family (in Ppu) possessed paralogs. All the four Pseudomonas species were found to possess paralogs for PBP's of ABC Zn2+ and Mn2+ transporters. Psy alone has paralogs for PBP of ABC Mo2+ transporter. Ppu has two paralogs for CitMHS family, which are presumed to facilitate transport of Citrate-Mn2+ complex while in Pfl this family has three paralogs with specificity for Mg2+/citrate. All the four Pseudomonas species have paralogs for MIT family and P-type ATPases. Except for Psy all the three species possessed paralogs for RND and CDF families. Psy and Pfl have paralogs for ILT family, mediating lead transport alone in the former while both ferrous iron and lead transport are mediated in the later. In Ppu ArsB family has two paralogs that are part of separate arsRBCH operons while in Pfl out of the two paralogs (PFL_2185, PFL_3288) only former is located within an arsRBCH operon. In view of the mosaic nature of genomes of the Pseudomonas spp we identified metal transporters with GI associated features from our inventory (see Additional files 6, 7, 8, 9). In our analysis we identified three distinct categories of transporters: those with anomalous composition (%G+C) alone, anomalous composition plus other GI associated features, normal %G+C plus GI associated features (Additional files 6, 7, 8 and 9). We identified thirty-two transporters (45.71%) in Ppu possessing highly significant GI features while they were twenty-six (48.10%) in Psy, nineteen (26%) in Pfl and seventeen (26%) in Pae. Families with strong GI features that were present uniquely in a species were: CPA3 family (sodium ion homeostasis), ABC family (Cu transporter), P-type ATPase (Cu transporter) in Pae, NhaB family, NiCoT family in Ppu, NSS, MScS and CitMHS families in Psy. ABC transporter for Molybdenum was found to have GI features in the three Pseudomonas except for Pfl. Strong GI features were observed only for certain paralogs of metal transporter families indicating that paralog expansion could have occurred through HGT (Additional 10). These results show how different metal transporter families vary in their propensity for HGT among the four spp. In this article we performed a dataset cataloging for 262 metal transporters from four representative Pseudomonas species. This is the first comprehensive genomic comparison of metal transporters, providing potentially important insights into the fundamental molecular aspects and novel facets of Pseudomonas metal transportomes. Our comparative inventory identified and analyzed novel metal transporters belonging to the following families: NiCoT (PP_2968, PSPTO_4280), Ca P-type ATPase (PA1429), Cu P-type ATPases (PP_4261, PA1549), ZIP (PP_1836, PP_0947, PFL_4718, PFL_0910, and PSPTO_2053) and MgtC (PP_3244, PP_3541, PA4635, PFL_4077, PFL_2871). Psy possessing least number of metal transporters showed maximum percentage (48%) of transporters with strong GI features. Our data is substantiated by the previous observations where majority of Psy ORF's shared features with horizontally transferred genes . Ppu has 45% of its transporters possessing strong GI features. On the contrary, Pfl and Pae have only 26% of their metal transporters exhibiting GI features. This comparative inventory can therefore provide a window for Pseudomonas community in mining large and heterogeneous data sets obtained from metagenome projects to identify new biologically relevant patterns of metal transporters resembling those in this study. A combinatorial approach of transcriptomics and functional genomics will aid in deducing the functions of these diverse metal transporters and assembling a complete picture of metal homeostasis. AH was funded by grant from CSIR [9/132/663-03], New Delhi. This work was also supported by Indo-French Project grant no: 3709-1 [20(A)/PMM/IFP/BCD-07]. AH performed the complete insilico analysis and wrote the draft of the manuscript. AR contributed to critical evaluation of the work and improvement of the manuscript organization. PMM conceived the study, guided the complete work and corrected the manuscript.